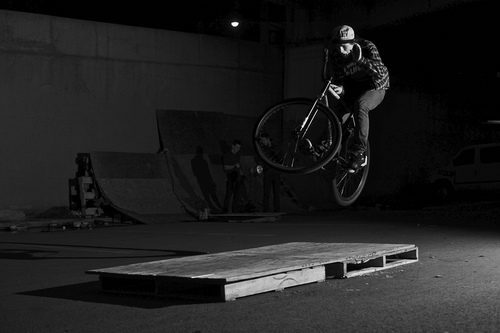 Andy T. came out to Peel Sessions last night and snapped some pics of Wonka riding. At the beginning of the night, we set up some pallets to make a little mannie pad. People were getting creatively techy with it. Wonka was hitting a nose-pivot slider to hop bar on and hop bar off. Here’s a shot of him mid-air hucking a barspin. Check out the other shots here. Great capture and the line wasn’t half bad either!